Home BIANCA GONZALEZ Bianca Gonzalez baby bump swimsuit photo: Look! Bianca Gonzalez, who just got married to PBA player JC Intal last December, is now 3-months pregnant! The TV host herself confirmed that by posting on Instagram her first baby bump photo, taken by her husband during their recent vacation, as she thanked everyone for the congratulatory messages. @iamsuperbianca: "We can't thank everyone for all the messages of love and support for this new chapter in our lives!!!! Our little one is 3 months in my tummy and healthy and well. The journey has been beautiful but also really tough and I salute all moms for holding THE toughest job in the world! This is my first baby bump photo taken by the proud daddy, @jcintal7. #jcandb"
The proud daddy on one hand also shared on Instagram a photo of them during Bianca's 1st month of pregnancy. In his caption, he said that he's been waiting and praying for it to happen. 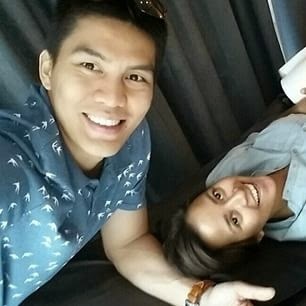 @jcintal7: "Thank you Lord God for blessing us with the gift of another life. (I took this photo 2 months ago and we are just very happy to share that @iamsuperbianca and I are going to be parents! Ito na yung pinakamatagal ko ng hinihintay at pinagdarasal... ang maging isang ama. Thank you for all who also prayed for this.) #babyrocket"
So, congratulations Bianca Gonzalez and JC Intal for that upcoming beautiful experience - which is to have a baby! Now that she's pregnant, will Bianca Gonzalez still serve as one of the hosts of Pinoy Big Brother (PBB) 737 airing possibly later this year? Or will she also sacrifice any showbiz commitments, just like Marian Rivera who gave up her role in 'The Rich Man's Daughter' and was replaced by Rhian Ramos? Speaking of Marian, the Kapuso Primetime Queen got married to Dingdong Dantes also last December, and she's also 3 months pregnant. It seems that it's not just a break-up season this Summer (Gerald Anderson and Maja Salvador, Erich Gonzales and non-showbiz boyfriend), but also a pregnancy season. Celebrities in the "pregnant club" are Marian Rivera, Empress Schuck, Angelika dela Cruz and now Bianca Gonzalez.